Ideally situated between Clerkenwell and the City, the Farringdon rentals market is an up-and-coming area for the city dwellers and young professionals alike. Farringdon rentals are home to those looking for a centrally located area to lay their head after a long day in the office. Those in Farringdon rentals are able to take advantage of the area’s increasingly popular nightlife nearby. Faringdon is nestled between the Barbican and St Paul’s. Farringdon is centrally located and offers easy access to the rest of the city by bus, tube or on foot. The district is a design destination and has more creative businesses and architect firms per square mile than anywhere else in the world. Consequently, it’s become a bit of a haven for young and trend-conscious professionals to live in Farringdon rentals. 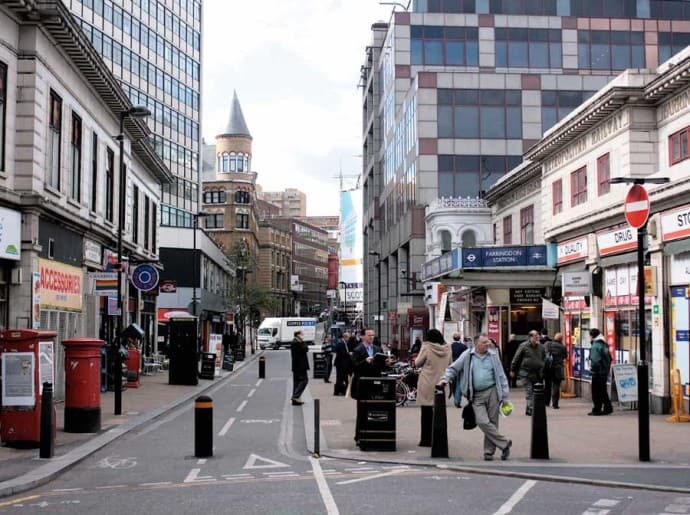 Farringdon, locally known as the area around the station, is dominated by densely populated buildings. Here, Farringdon rentals are housed in these buildings containing modern apartments for those looking to be in the heart of the City. This area is a fun, smart, vibrant and blossoming district of the capital that has much to offer. Every week there is a new restaurant in Farringdon exciting the foodies of the area. This, in turn, creates a buzz on the internet, and even benefits the plethora of local coffee hangouts. Also, home to numerous pubs, restaurants, and markets, Farringdon is said to be the “grown-up version” of Shoreditch. The neighborhood has its roots in the twelfth century, but in recent years has experienced a spectacular comeback as one of London’s most fashionable places to live and work. Thanks to the gentrification of ex-warehouse buildings, there are now some new Farringdon rentals that are loft-stipe apartments dominating this area. Farringdon rentals catch the eye of the young professional and artsy types. The area gives off a relaxed city vibe and has become one of the most desirable districts for those looking to experience an urban lifestyle. The Farringdon rentals market is considered to be an expensive area to live, but considering the proximity to central London, you’re paying for location. Farringdon, being a very sought after destination, is on the higher end of the spectrum when it comes to price, but with such an ideal location and fantastic local amenities, you will be hard pressed to find such a place elsewhere at any price. Want to know more about Farringdon Rentals? Bird of Smithfield, a contemporary European eatery, consists of a smart rooftop bar, a modern dining room, lounge bar, private dining room, and a basement cocktail bar. Open from breakfast to dinner and then late into the night, this laid-back restaurant is a local favorite. Alan Bird, the chef-proprietor, has headed the kitchen at The Ivy and also was executive chef at the infamous Soho House Group, making it as to no wonder this hot spot is so popular. Considered one of the most beautiful and unusual bars in London, the Zetter Townhouse is an excellent hangout spot. Having a short but quirky cocktail list, devised by Tony Conigliario who is known for his experimental techniques and ingredients. Locals who frequent the Zetter Townhouse are those who are into a more eccentric side of life. With generous table spacing and strange decor, this pub brings in a broad mix of individuals who have an eye (and taste) for the truly bizarre. Bounce, an entertaining local favorite, is a ping-pong bar that serves up a night of boozy and competitive fun in an industrial chic space. With 16 pong tables, this bar restaurant is a winner of the Time Out Love London Awards. Allegedly located on the very spot where the game was born, this quirky place serves up the likes of antipasti and wood-burning oven pizzas along with moderately priced ales and cocktails. For an unusual shopping experience, Farringdon rentals residents head to the Leather Lane Market. In this down to earth market, you never know what you might find. Housing the likes of stalls bearing fruit and vegetables to batteries, cell phone accessories, and backpacks, all at bargain prices. Postman’s Park, a hidden gem of London, is a quaint greenery near St. Pauls. The main feature is a wall of thirty-four decorative tiles which record the heroic deeds of ordinary Londoners who tragically lost their lives to save others. Featured in the movie “Closer”, starring Jude Law and Natalie Portman, this vibrant green park features a well looked after garden with manicured lawns and an abundance of seating for the locals to come enjoy the outdoors on a sunny London day. Farringdon rentals are in a central location making it is easy to get to by public transport. Farringdon tube station houses the Circle, Hammersmith & City, and Metropolitan lines; as well as being not far from Barbican and stations in Islington.